OpenAPI for API creation, including declarations of path operations, parameters, body requests, security, etc. Automatic data model documentation with JSON Schema (as OpenAPI itself is based on JSON Schema). Designed around these standards, after a meticulous study. Instead of an afterthought layer on top. This also allows using automatic client code generation in many languages. Interactive API documentation and exploration web user interfaces. As the framework is based on OpenAPI, there are multiple options, 2 included by default. Swagger UI, with interactive exploration, call and test your API directly from the browser. 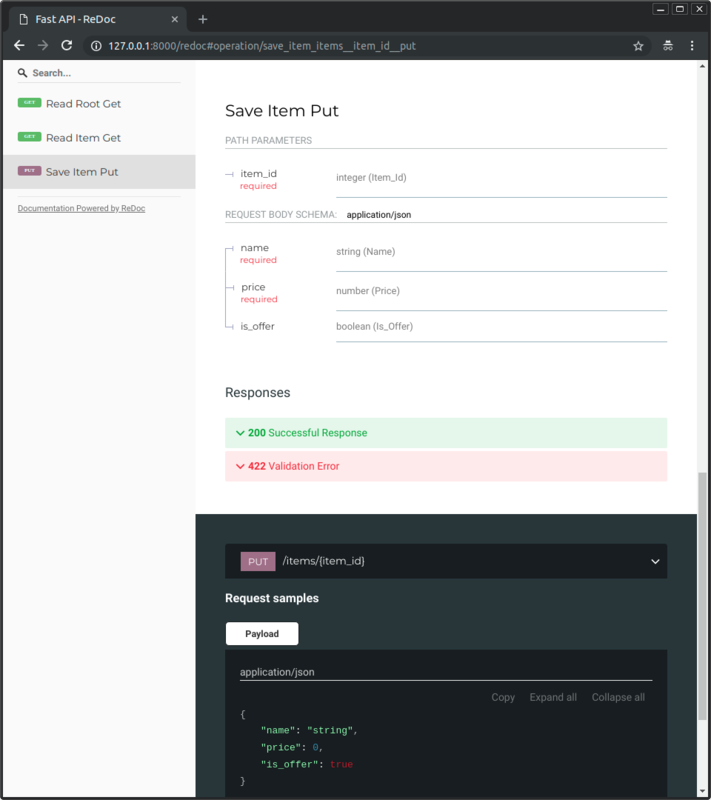 Alternative API documentation with ReDoc. It's all based on standard Python 3.6 type declarations (thanks to Pydantic). No new syntax to learn. Just standard modern Python. If you need a 2 minute refresher of how to use Python types (even if you don't use FastAPI), check the tutorial section: Python types. All the framework was designed to be easy and intuitive to use, all the decisions where tested on multiple editors even before starting development, to ensure the best development experience. In the last Python developer survey it was clear that the most used feature is "autocompletion". The whole FastAPI framework is based to satisfy that. Autocompletion works everywhere. You will rarely need to come back to the docs. You will get completion in code you might even consider impossible before. As for example, the price key inside a JSON body (that could have been nested) that comes from a request. No more typing the wrong key names, coming back and forth between docs, or scrolling up and down to find if you finally used username or user_name. It has sensible defaults for everything, with optional configurations everywhere. All the parameters can be fine-tuned to do what you need and to define the API you need. But by default, it all "just works". JSON array (list) defining item types. String (str) fields, defining min and max lengths. Numbers (int, float) with min and max values, etc. All the validation is handled by the well-established and robust Pydantic. Security and authentication integrated. Without any compromise with databases or data models. OAuth2 (also with JWT tokens). Check the tutorial on OAuth2 with JWT. Plus all the security features from Starlette (including session cookies). All built as reusable tools and components that are easy to integrate with your systems, data stores, relational and NoSQL databases, etc. 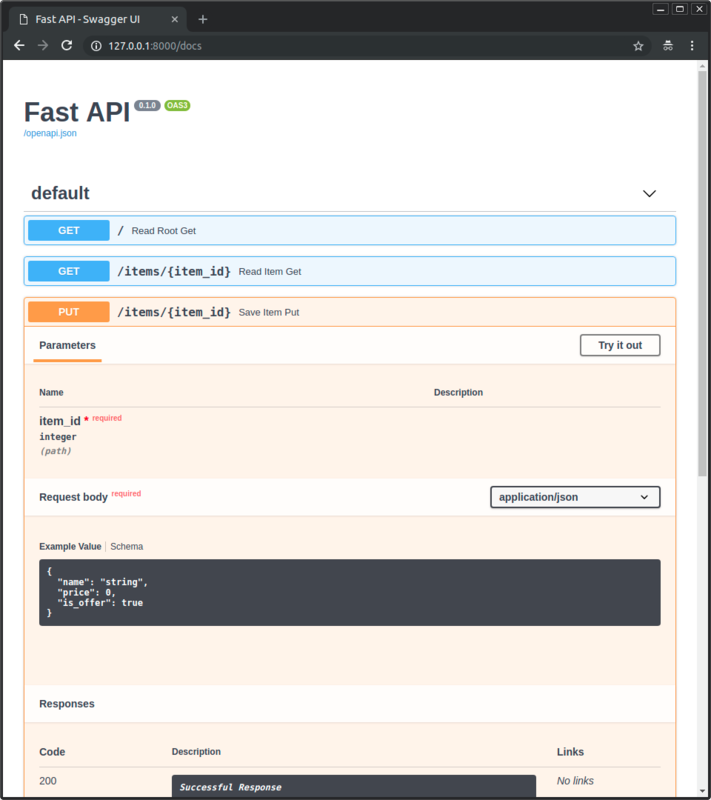 FastAPI includes an extremely easy to use, but extremely powerful Dependency Injection system. Even dependencies can have dependencies, creating a hierarchy or "graph" of dependencies. All automatically handled by the framework. All the dependencies can require data from requests and augment the path operation constraints and automatic documentation. Automatic validation even for path operation parameters defined in dependencies. Support for complex user authentication systems, database connections, etc. No compromise with databases, frontends, etc. But easy integration with all of them. Or in other way, no need for them, import and use the code you need. Any integration is designed to be so simple to use (with dependencies) that you can create a "plug-in" for your application in 2 lines of code using the same structure and syntax used for your path operations. 100% type annotated code base. 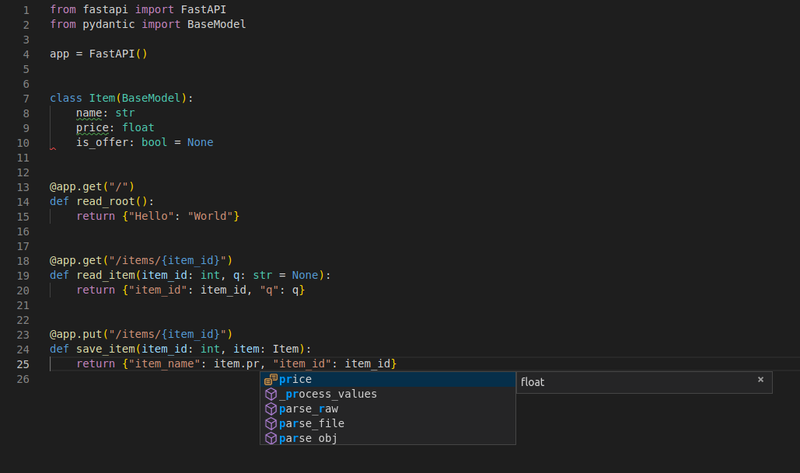 FastAPI is fully compatible with (and based on) Starlette. So, any additional Starlette code you have, will also work. FastAPI is actually a sub-class of Starlette. So, if you already know or use Starlette, most of the functionality will work the same way. Seriously impressive performance. It is one of the fastest Python frameworks available, on par with NodeJS and Go. Test client built on requests. CORS, GZip, Static Files, Streaming responses. FastAPI is fully compatible with (and based on) Pydantic. So, any additional Pydantic code you have, will also work. Including external libraries also based on Pydantic, as ORMs, ODMs for databases. This also means that in many cases you can pass the same object you get from a request directly to the database, as everything is validated automatically. The same applies the other way around, in many cases you can just pass the object you get from the database directly to the client. No new schema definition micro-language to learn. If you know Python types you know how to use Pydantic. Use of hierarchical Pydantic models, Python typing’s List and Dict, etc. And validators allow complex data schemas to be clearly and easily defined, checked and documented as JSON Schema. You can have deeply nested JSON objects and have them all validated and annotated.